The Green Economy Coalition Global Meeting 2019 took place in Cape Town, South Africa, from January 8th – 9th 2019. This vibrant, delegate-led event brought together representatives of business, finance, NGOs and citizen’s groups from around the world in order to debate and decide how we can help to make the economies of the future equitable, inclusive, and people-focused. On this page, we're bringing together all the documents, slideshows and photos from our week in Cape Town. We'll also be publishing a more detailed report on the Global Meeting, including our highlights and lessons from our partners, in the coming weeks, so watch this space. We've set up a shared Google Photos Album where you can access pictures from the 3 days of our Global Meeting, our UN-PAGE Ministerial side events, and our CNBC Media Debate. 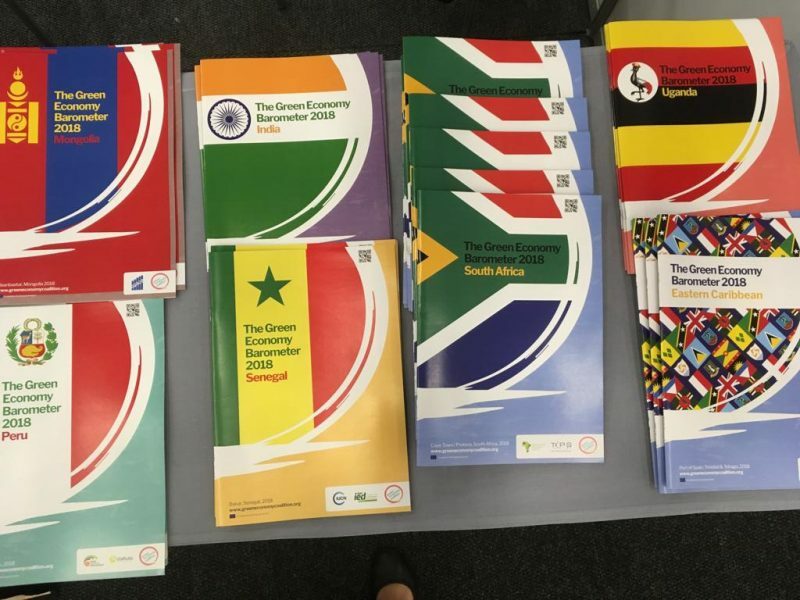 During the event, all seven of the Green Economy National Barometers were launched - covering our hub partners around the world in the Caribbean, India, Mongolia, Peru, Senegal, South Africa and Uganda. They're now all available to download in our new Publications Library.